SSEP Mission Showcase – Mission 9 to ISS: SpaceX Webcast of the flight of SpaceX CRS-10. The SSEP Mission 9 to ISS Endeavor payload of 21 student experiments launched aboard SpaceX CRS-10 from NASA Kennedy Space Center, FL, 9:38 am ET, February 19, 2017. The experiments returned to Earth for student flight team harvesting and analysis on March 19, 2017. The 21 experiments reflect the culmination of 11,890 grade 5-12 students fully engaged in microgravity experiment design, and 2,466 flight experiment proposals received from student teams across the 21 communities participating in SSEP Mission 9 to ISS across the U.S. and Canada. Mission 9 student research teams presented at the SSEP National Conference 2017, 2018, and 2019, held at the Smithsonian National Air and Space Museum. Mission 9 media coverage includes over 90 articles. Over 12,790 students were engaged in the Mission 9 Mission Patch art and design competitions, resulting in 31 Mission Patches accompanying the Mission 9 flight experiments to ISS. Be part of the adventure on the high frontier – consider participating in Mission 14 to the International Space Station, starting September 2019. Washington, D.C. – The National Center for Earth and Space Science Education (NCESSE) and the Arthur C. Clarke Institute for Space Education announce a new opportunity for school districts across the U.S., Canada, and internationally to participate in the 16th flight opportunity of the Student Spaceflight Experiments Program (SSEP). SSEP Mission 14 to ISS will provide each participating community a real research mini-laboratory capable of supporting a single microgravity experiment, and all launch services to fly the mini-lab to ISS in late Spring 2020, and return it safely to Earth for harvesting and analysis. Mirroring how professional research is done, student teams across the community submit research proposals, and go through a formal proposal review process to select the flight experiment. The design competition – from program start, to experiment design, to submission of proposals by student teams – spans 9 weeks from September 3 to November 1, 2019. A curriculum and content resources for teachers and students support foundational instruction on science conducted in microgravity (in a weightless environment) and experiment design. Additional SSEP program elements leverage the experience to engage the entire community, embracing a Learning Community Model for STEM education. 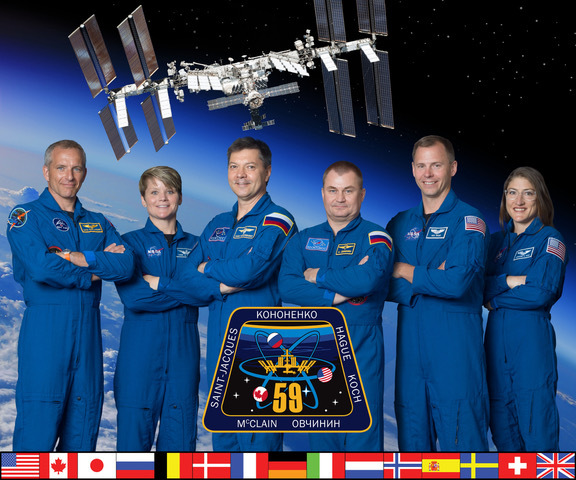 SSEP Mission 14 to ISS includes an experiment design competition September 3 through November 1, 2019. Flight experiments are selected by December 17, 2019, for a ferry flight to ISS in late Spring 2020. All communities interested in participating in Mission 14 to ISS are directed to inquire no later than April 26, 2019 [extended to May 17, 2019]. Heritage: There have been 15 SSEP flight opportunities to date—SSEP on STS-134 and STS-135, the final flights of Space Shuttles Endeavour and Atlantis; and SSEP Missions 1 through 13 to ISS. A total of 178 communities have participated in the program, reflecting 41 States and the District of Columbia in the U. S., 4 Provinces in Canada, and a community in Brazil. Thus far 52 communities have participated in multiple flight opportunities, reflecting the sustainable nature of the program. Through the first 15 flight opportunities (through Mission 13), a total of 109,950 grade 5-16 students across 2,192 schools were fully immersed in microgravity experiment design and proposal writing, 22,442 flight experiment proposals were received from student teams, and 281 experiments were selected for flight. Through Mission 12, 113,000 students across the entire grade preK-16 pipeline were engaged in their communities’ broader STEAM experience, submitting 99,450 Mission Patch designs. All 240 experiments selected for flight through Mission 12 have now flown. The Mission 12 experiments returned to Earth on August 3, 2018. Another 41 experiments are expected to launch in Summer 2019 as the Mission 13 Gemini payload of experiments on SpaceX-18, launching from Kennedy Space Center, FL.